You’re in the craft store, where you swore you were just going to pick up that one thing for your next project. The next thing you know, you’re at the checkout with $60 worth of who knows what in your cart. No judgment; I’ve been there many times. We crafters are notorious supply hoarders. But I’ve been on a mission lately to declutter my stash and make my supplies multitask. Yet, the one place I just can’t cut down on is my glue. Sometimes you just need different kinds for different jobs. 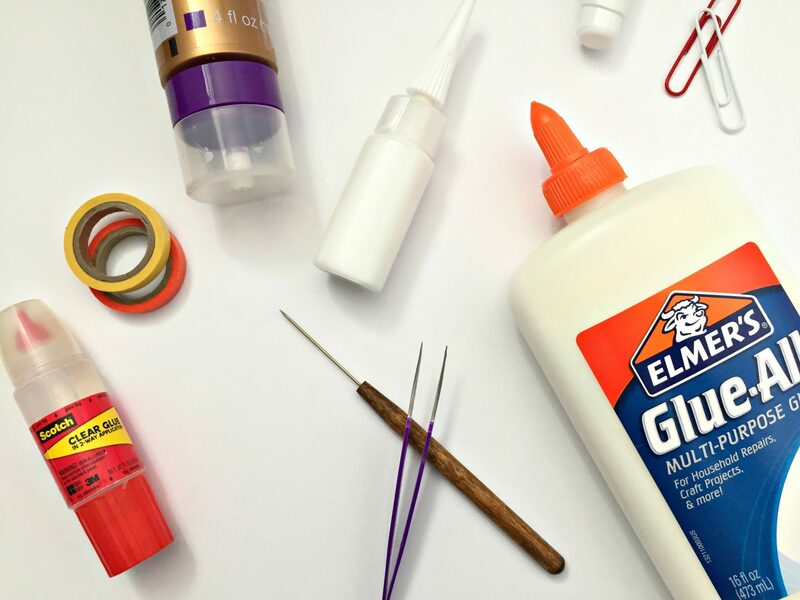 Now I’m sharing the 4 types of glue every quilling artist needs to have in their toolbox and when to use them! White glue is going to be what most quillers will use most often. All the regular coils, shapes and edging will work just fine with this. White glue is also useful for strengthing the inside of paper domes and adhering quilling to cards or the backings of your choosing. I prefer Elmer’s Extra Strong Glue applied with a needle-nosed bottle. If you’ve been following me for any length of time, you’ve heard me go on and on about how much I recommend grabbing one of these bottles. They are extremely helpful in dispensing just the smallest amount of glue and preventing gluey, sticky messes. If you’re ready to expand your quilling into 3-dimensional creations, Aileen’s Tacky Glue will be your new best friend. Tacky Glue is quite a bit thicker than regular glue, but it dries clear. As the name implies, it comes out of the bottle tacky. This is perfect for any work with heavier pieces that you don’t want to have to hold in place for a long time waiting for glue to dry. I couldn’t have made these paper succulents without it! One drawback of Tacky Glue is how slowly it comes out of the tube. There is a bottle design that allows it to sit upside down, so the glue is ready when you need it! I’ve also played with a Tacky Glue dispensing pen. I find this a little more difficult to work with, as it’s harder to squeeze but that’s a personal preference thing. If you’re working a lot with dark colored strips and you’ve noticed a problem with visible glue on your paper, try using clear glue. I’ve found that no matter how hard I try, I always get some dried glue on the outside of any black shape I make. Clear glue has saved me a lot of frustration and clean up! Some quilling crafts need just a little more oomph. That’s where a hot glue gun will come into play. I pull out my favorite hot glue gun when I’m adding quilling to some sort of decor items, like wreaths or plaques. The tough glue helps the quilling stay put on uneven surfaces. It will also keep everything in place if its some type of seasonal decorations that are going to be packed away for most of the year. Just watch those fingers, please! The great thing about this list of my the 4 types of glue every quilling artist needs is that none of them are expensive at all. Of course, some types of glue can be used for all purposes, but why not experiment and see what works best for you? Maybe you’ve found something else that you prefer to use? Feel free to leave any recommendations below! Thanks for the info. It is very informative. I will keep this for future reference. Wonderful! Thanks for taking a look! I hope you do, Chris! If you find something you like, stop back and tell us about it please! I find it a bit annoying when you buy a special spray glue that you may not use very often, you have to throw it out because it does not work any more.. For example, placing parchment paper on a card where you do not want a glue that shows. I haven’t used spray glue much since art school, but I agree – I hate wasting product too! Great site!! I, too, am a self-taught quiller. I do have one question. Can I effectively use a COLD temperature glue gun in place of the HOT? Thanks so much for having this site. Hi there, Charlene! Great question ~ From what I know about glue guns, the big difference is that the low-temp glue guns are better for delicate materials that can melt under the heat of the high-temperature hot glue. The higher temp glue sticks are better for when you’re looking to have a quicker, stronger bond. I think that even though the hot glue won’t harm most quilling projects, the low-temp glue sticks will work just fine since paper is so lightweight. I hope that’s helpful! Thank you so much for this info! I am new to Quilling, and loving it, and this is very helpful to me thank you! So great to hear from you, Kathy! I hope you’re enjoying quilling! I need some help. I’m a beginner that just finished a snowman that will be a Christmas decoration to hang on a door. This project was probably for a more advanced quiller and I didn’t have a pattern or any directions. I couldn’t help myself because it was so cute. I used Elmer’s glue and the back has dried glue everywhere. What can I do to make the glue disappear? How do I preserve my project? Yikes, it’s the worst when you finish a project and you find glue bits left over! First of all, it’s probably true that because we’re all our own worst critic, the glue isn’t as visible as you think it is. But I do have a couple suggestions of things that I’ve tried in the past. You might try scraping at small bits of glue with a needle tool to see if they pop off. I’ve also used a very sharp craft knife to cut glue away from the sides of my quilling. Be aware this could peel away part of your background. Another option is to cut around the outer edge of your entire snowman and remount it. If you can, email me a photo at meredith@thepaperycraftery.com. I might have better ideas if I can see your project. I’m sure we can save your snowman! Hi Meredith 😊 for the white glue I prefer to use the book binding type. Fast dry, almost instant grab and dries clearish, slughrsl opaque… I have yet to find the best clear glue… Mine is quite messy even when I use the needle tip bottle… Strings everywhere. If i put some by an accident on a darker background, it leaves an unsightly mess too. I think itsi possibly too thick or gel like. When applying individual strips to your background (like when you apply an outline to letters) would you apply glue to the background, following the outline, or to the paper strip? Hi Sandrine! Thanks for the tip about the book-binding glue. I’ll have to keep an eye out for that. When I’m gluing strips, I like to apply my glue with a needle-nosed bottle right to the paper, then wipe away any extra with a small paintbrush after it’s placed. If the strip is really tiny, I’ll dip the end in glue instead. Hi Meredith, this is great info! I’m new to the world of quilling, and I had just made a beautiful flower the other day. I used the same clear glue I used for the paper to glue on some rhinestones. The only thing is, they fell off the next day! 🙁 Is there a particular glue you can recommend to help keep these embellishments from falling off? Thank you sooo much! Hi Dianne, I’m glad you’ve found quilling! I’ve never worked with rhinestones, but I did a little research. I’m not sure what clear glue you tried, but I read that E6000 is a popular glue for rhinestones. Another recommended GemTac Glue by Beacon. I’ve used E6000 many times for other crafts that weren’t quilling, and it is a bit messy, but holds well. Whatever you try next, I would definitely do a test first on some spare paper, and use as little glue as you can! I used Elmer’s Natural Clear school glue made from plants. It works great on paper. The reason why I dont use white glue is that I find that it leaves residue on the flowers/designs. I will give your suggestions a try. Thank you so much!! Hi, I have never done quilling; I was just admiring the art yesterday. I watched a bluprint.com class because they were free for a while, and I specifically wanted to see how some people apply glue to an outline (it was literally a swirl of paper and I thought “how is she going to do this?”). Well, the artist (Cecelia Louie) took the glue and squirted some on a little flat plate, then she proceeded to take her swirl to that glue and lightly immerse the sides, then glued to her card. Hi Doris, I’m glad you’ve discovered quilling! We do sometimes dip our paper in glue, it’s true!